A Whole New Kind Of Crochet Kit Club! Ever since I began designing crochet, everything in my life became about yarn (and my kids). Even the books I read for pleasure! Although there is only one fictional series specifically about Crochet, there are plenty of "Knit Fic" series. If you are into mysteries or romance there are several series out there for you. I found that, although I don't knit much, I enjoyed those series just as much, as they describe the fibers, yarns, and stitches, and sometimes give me ideas for my own projects. I even did a series of blog posts back in 2013 reviewing some of my favorites. But this lack of crochet fiction seems to be a gap that is begging to be filled. So about the same time I discovered this Fiber Fiction Genre, I started dropping (not so subtle) hints in the ear of my good friend and neighbor, Carissa (a.k.a. C. Jane Reid). When we first met, she told me that she was a writer of historical fiction with some aspects of the paranormal, but she was not an "author" yet because she had not published a book yet. When Monica and I started talking about starting a Crochet Kit Club with my patterns and her hooks, Carissa offered to help us. She LOVED the idea of a crochet kit club, and we knew we would need her awesome organizational skills to manage and maintain a big project like this. But I wanted her to be able to contribute to the kit in some way, to really be a part of the team. Some time last year she had told me about an idea she had for a contemporary crochet fiction story, and we brainstormed all sorts of directions the story (or possible series) could take. Inspiration struck when I asked Carissa to contribute a short story to each kit that could tie in to the pattern in some way. 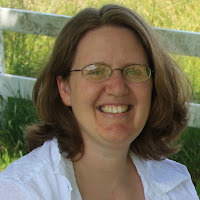 We chatted more about the world she wanted to build for her contemporary crochet fiction stories, and came up with a series of short story ideas that could build the history of that world, to go with each kit. But we quickly realized that she is not so much a short story writer as a novel writer, when the "short story" for the first kit, decided to be a Novel. We did have to do a little shuffling, but we made that story work for the first three kit clubs in 2015, and I did not even have to change the patterns I had planned very much to still fit the story. And we are having so much fun fitting the patterns and gifts for the Kit Club into the story! Next year we are again planning a series of short stories for each kit... but I am not counting on it, until she has actually completed the stories. The bonus of her writing longer stories is that we already have story ideas through 2017, moving from colonial times throughout various periods of history, which could go even longer if any more characters decide they need more room to tell their stories. The best part of this process is helping my friend become a "published author". Carissa helped me publish my first book by editing it for me. I remember when we got the first printed copies she told me, "Your a published author now!" So, this year, instead of writing another book myself, I got to help one of my best friends be able to say the same thing! 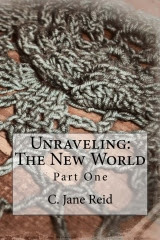 Join us in our Ficstitches Yarns Ravelry Group this Friday, July 10th, for a Live Book Club Chat with author C. Jane Reid! If you did not get our first kit, and want to check out C. Jane Reid's first story, you can buy the print copy or ebook. Our second Ficstitches Yarns Crochet Kit Club is available for Preorder this month so you can be among the first to get Part 2 of the Story. 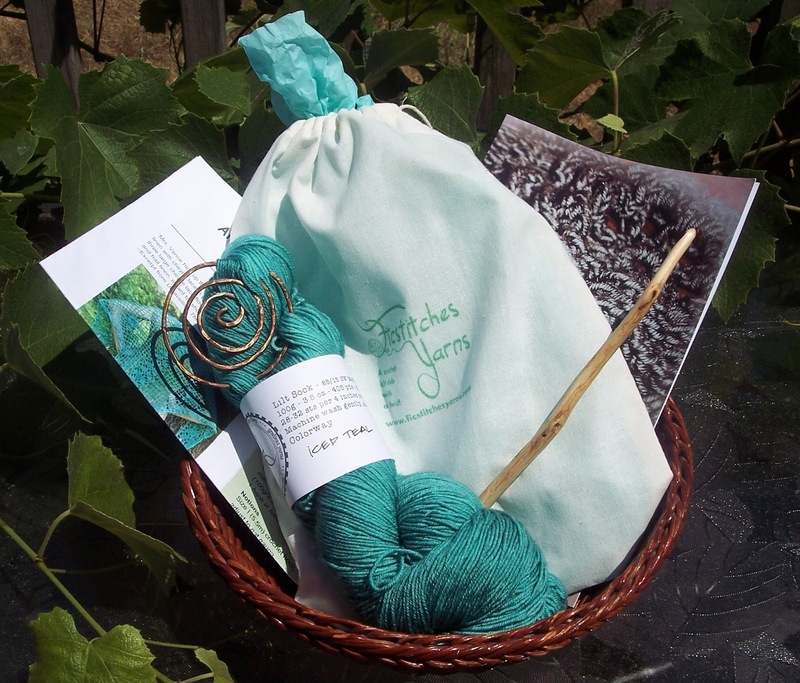 I love the club, the yarn, the pattern, the shawl pin, the cute little wood ruler and the little bag to hold it all, with the stories! What a great deal! Thank you so much for such a wonderful collaboration:) Keep up the beautiful work and may God bless each of you, Thank you again.